Happy Halloween! 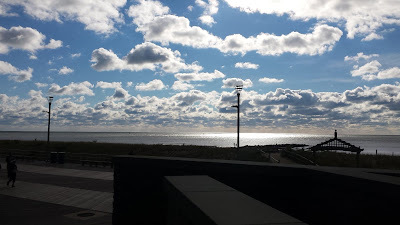 September and October have been such amazing months, packed full of so much for us that we just forgot to make a blog post for September (oops). 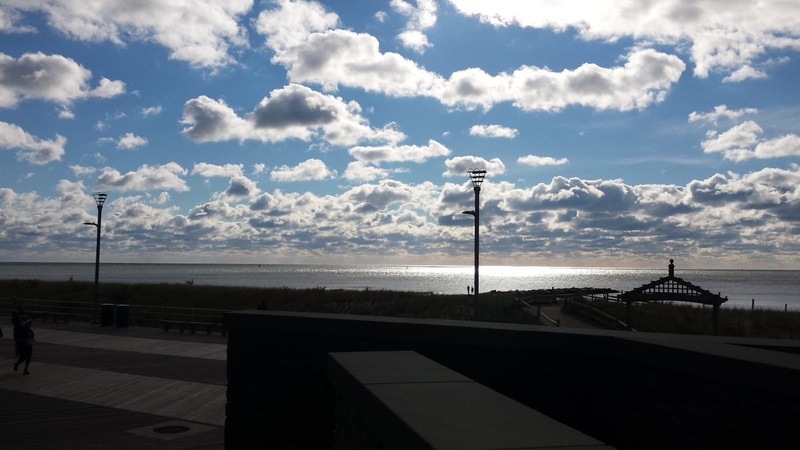 October is always our big event season and we're no strangers to travel; but this September/October brought us to Columbus, Dayton, Atlantic City - NJ, and Huntington - WV! 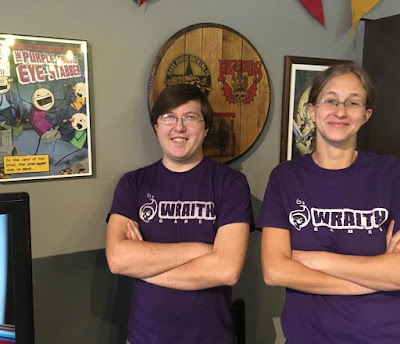 While not planned, doing big ol' "4 event blog posts" around this time of year has become commonplace for us, since we just don't have the time to do individuals with all that travel (you can read last year's here: https://www.wraithgames.com/blog-all//2017/10/events-events-events-events-oh-yeah-and.html and the year before that, here: https://www.wraithgames.com/blog-all//2016/11/madness-4-events-in-3-weeks-dayton.html). Anyway, it was great to stretch out and take on some events new and old. So, let's talk about them! If you remember, late August was the Matsuricon GDEX Megabooth! For late September, however, it was finally time to head off to the real GDEX. 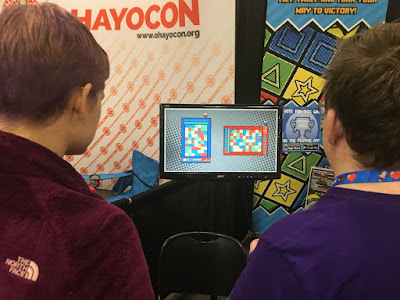 The time leading up to that was spent adding more accessibility options to Collapsus and adding more content to the Battle Mode that we premiered at Indy PopCon earlier this year. Gotta say, both goals were smashing successes! In order for us to get multiplayer and many of our last few accessibility options to work (also creating a big performance boost and smaller file size), Mark had to go back in to redo large swaths of the code. This is nothing unusual in game development, as code bits become more of a pile of spaghetti with time rather than nicely ordered logical sequences. He pulled through, though, and the Collapsus build we showed off was bigger and better than ever! This year wasn't just about showing off the new Battle Mode features, oh no. This was personal for us! 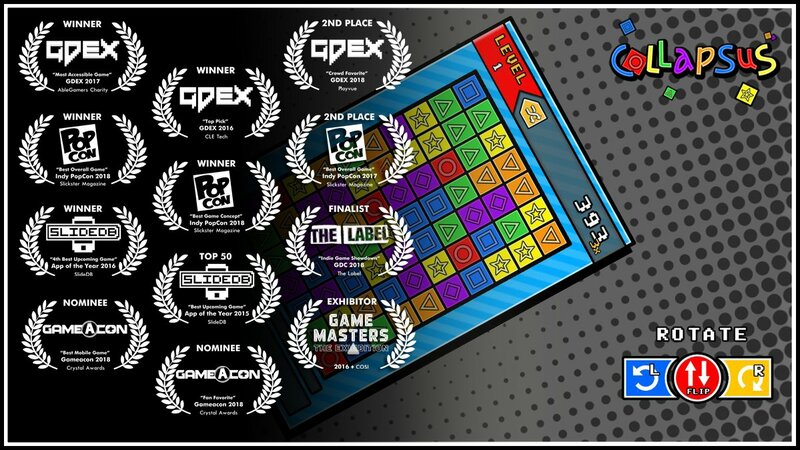 Zac Pierce's game Bombfest won the "Player's Choice" award the last couple years and we could not let that stand! We were going to dethrone that tyrant! 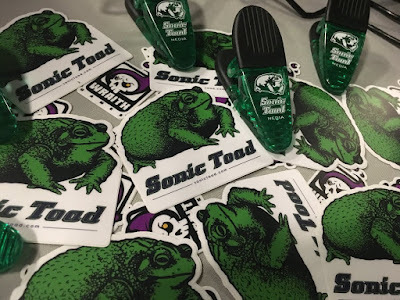 In all seriousness, though, because of a bit of a joke that started in the IGDA Cinci group on Facebook, we decided to get together with Zac's team and have a friendly competition to help cross-promote our projects. It was a LOT of fun. 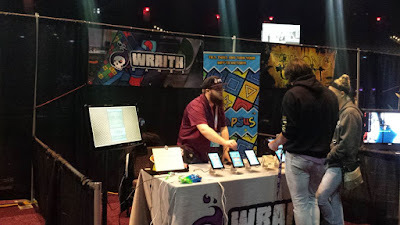 We started off by sharing pictures of us delivering "formal" challenges complete with glove-slapping, which escalated into us tagging their booth with our stickers, them tagging our team with Bombfest buttons, and in the final minutes, us placing our banner at their booth to "steal" votes. It was a real laugh! When all was said and done, both of us lost to the game "Atlas", but we did manage to slip into 2nd place with Bombfest getting 3rd. Of course, next year we have to team up to take down Atlas and gain some of our honor back. 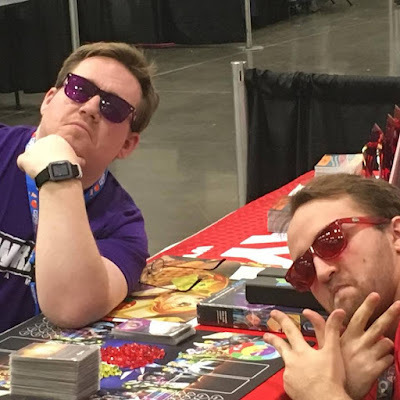 We also got interviewed a few more times, with Black God Media (here: https://youtu.be/O7bVxpxvn1c), Borderline Entertainment (here: https://youtu.be/mWdwH5XID1E), and Play Legit (here: https://playlegit.net/2018/10/30/indie-game-interview-collapsus/) there were a few others, but they haven't gone live just yet, so stay tuned! All-in-all it was another amazing weekend at GDEX! There was a ton more that happened at the event, but these were just some of the highlights (otherwise we'll be here all week). Up next? Kabo and Gameacon! It's funny, really. For the past 3 years, we've had the odd experience of splitting the team into two to head out to events. 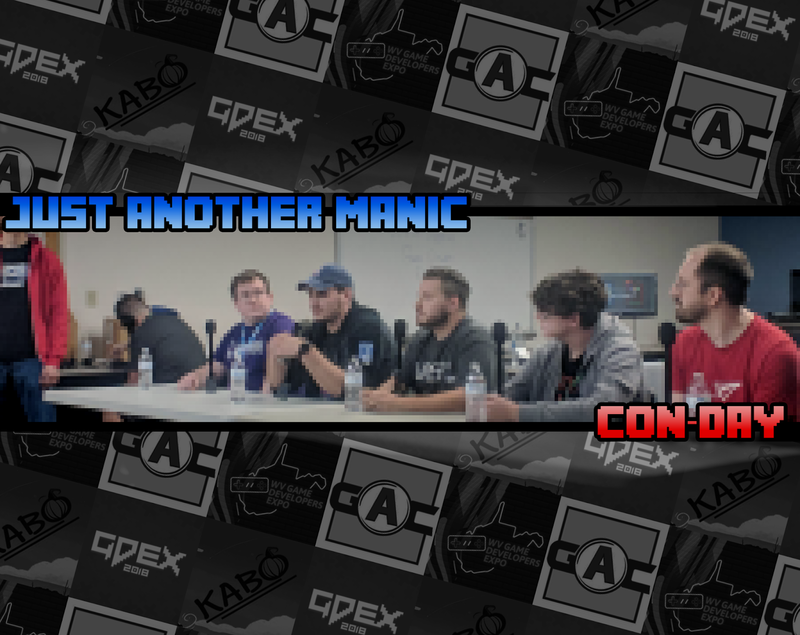 It all started with IndyPop and Origins, then it was GDEX and LexPlay, and last year it was LexPlay and Kabo! This year is no different. Kristy, Steve, Mark and Lucas went off to Dayton for our second year at Kabo (which is run by Griffin, so obviously he was already there), while Adam and I took on uncharted territories by heading off to Atlantic City, New Jersey for Gameacon! Kabo was only a one-day event, while Gameacon was two (well, three, if you count travel time), so let's start in Dayton. Back in IndyPop earlier this year, we officially held our first Collapsus tournament; though as far back as last year's Kabo, Griffin and I had the wonderfully awful idea of bringing a larger-scale Collapsus tournament to Kabo to sit alongside their annual Galatune tournament. Boy, we're glad we did! 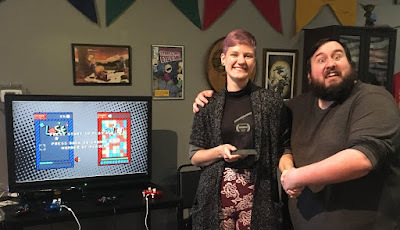 After GDEX gave us some amazing feedback, we made some tweaks to the multiplayer (which may now be nearly the final tweaks), and also bought a beautiful trophy for one skilled combatant to take home. 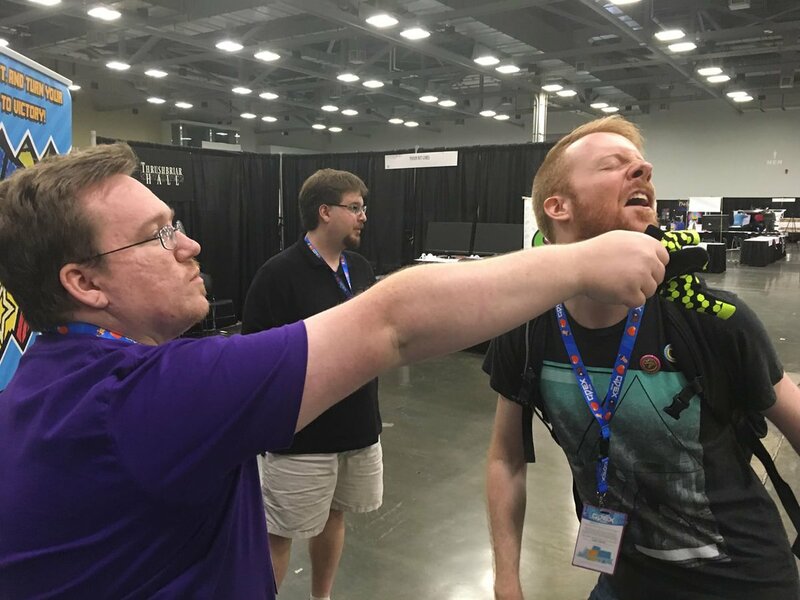 Now flash back to GDEX. 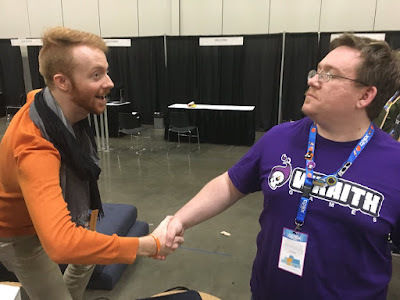 While I was off gallivanting around, schmoozing with other developers (much to Adam, Mark, and Steve's chagrin), a woman named Hannah came up and destroyed our entire team at one-on-one! I could not let this stand! We scheduled a meetup for the next day for me to restore the team's honor, and while I did manage to win, it was one of the closest multiplayer matches I've ever had. A real champion, this Hannah was. Cut to Kabo. I had the foresight to send out an invitation to her, as well as the IndyPop champion, Jason to the event (self-professed "biggest fan" Alyssa was already attending). While Jason could unfortunately not make it, Hannah arrived with (figurative) bells on. While I was not there to witness it myself, by all accounts she absolutely dominated the competition! 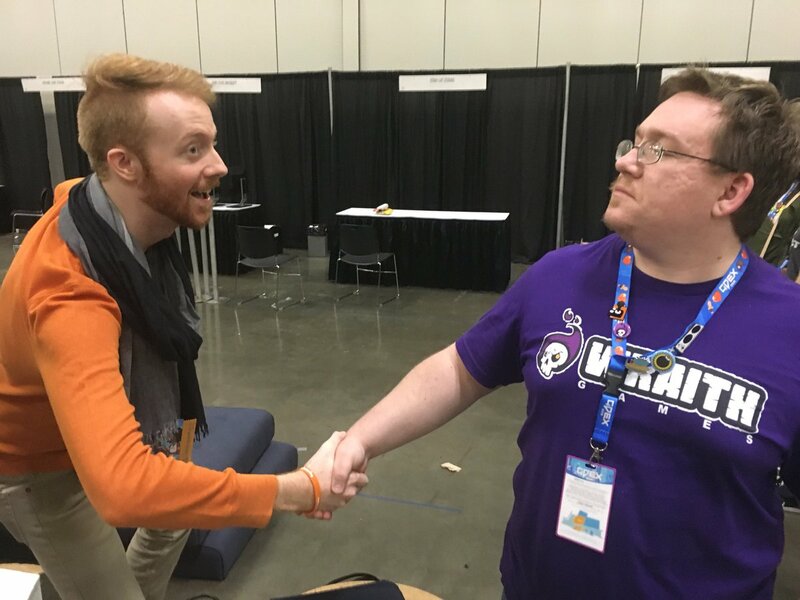 It is my hope that when we do our next big tournament at Ohayocon in January, we can see these two titans truly battle it out. As for the rest of Kabo, the event managed to raise a glorious $2,204 for Extra Life Dayton's cause, the Dayton Children's Hospital; the annual Kabo Galatune tournament went smashingly; our friends at Dolphin Hat Games had an absolutely nail-biting Taco Cat Goat Cheese Pizza tournament (a tournament that our very own Kristy managed to take home 4th place in); and lastly but certainly not least, they had by all accounts one of the funniest cosplay competitions that many observers have ever seen in awhile. What can you say other than another successful year at Kabo? A huge thank you to the D20: A Bar With Characters for once again hosting such a wonderful charity event. Fun fact, Kabo has been made an actual holiday in Dayton! Now, New Jersey. This was Adam's and my first time in New Jersey. We didn't know what to expect. It was a 14-hour drive up there, a task that we both had to stay awake for, lest the other become so bored that they fall asleep (well I mean, it's not like I drive, so Adam falling asleep would be the real tragedy... but you get my point). That meant that we then had to do the 10-hour event afterward, which would put us at 24 hours awake, followed by 8 hours of sleep, and then another 24 hours doing the reverse. Now, I must stress that we are a "no-crunch studio", and we did take the next couple days off after returning; however, this trip was way more enjoyable than that time-table makes it sound. We'd come to Gameacon because we'd heard good things from our friends over at Pxlplz, and Mega Cat Studios, who do the event every year (well, sadly, Mega Cat Studios did not attend this year, though the last time we talked to them about it, they were still planning to). 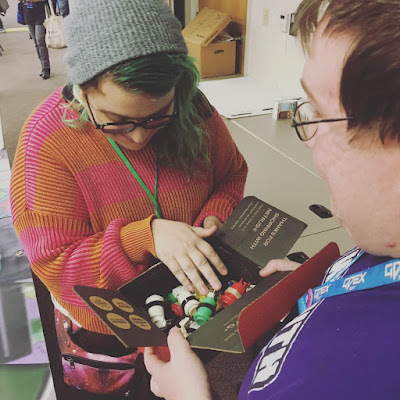 Fortunately, after talking to our friend Rachel at GDEX (eh, see, that piece of the story came back), it turns out she does the event every year as well... looks like we were in good company. Now, Gameacon is a bit of a smaller event, but it's getting bigger every year. 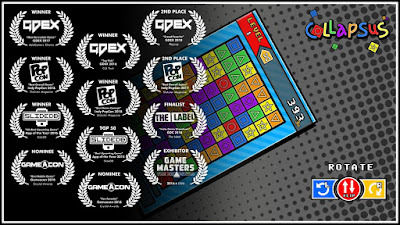 It reminds us of the second LexPlay or GDEX in 2015, as some good examples on size. What that meant was that it was small enough where we got to meet and hang out with a bunch of new developers. This is how you get a community started. Lucky for us too, several of them forgot bits of their booths, and since we always pack extra things, we were able to loan some stuff out. That makes for amazing icebreakers for conversation. Couple that with my overwhelming anxiety to need to know exactly what's going on at an event at any given time, people starting coming to our booth for information and logistical problem-solving. Not gonna lie, that felt good. While Gameacon had a bunch of wonderful exhibitors, and several eSports tournaments, the highlight for me at least was the awards ceremony. Now, I'm not gonna sugarcoat it, being a small event they didn't quite have their system for judging games down perfectly; however, it is in my opinion that with small game communities, indie game awards are vital for getting noticed and also as a way to sort of codify feedback on a project... so even an awards ceremony with room for improvement is a good thing. 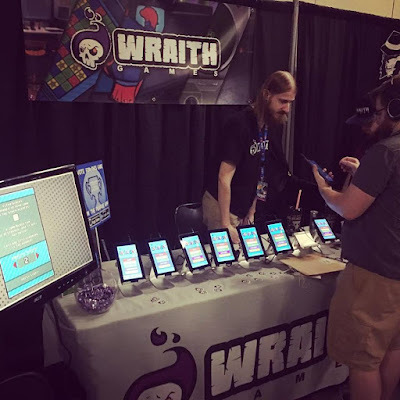 For Gameacon, we ended up bringing home nominations for both "Fan Favorite" and "Best Mobile Game", so count that as a success for us on the awards front! 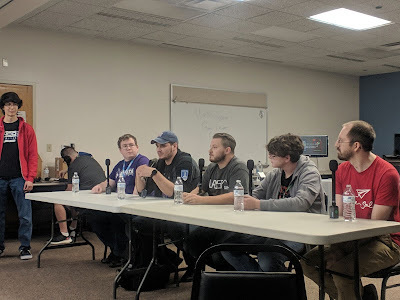 After our long drive home (containing, I kid you not, a 6-hour game of two-man 20 Questions), it was off to take some well-deserved rest and prep for the West Virginia Game Developers Expo. WVGDE is an interesting event for us. While we don't have any formal ties to West Virginia, over the past several years there was an urge for Ohio and Kentucky game development to be considered one community (whereas previously you had the Cleveland, Columbus, Cincinnati, and occasionally Dayton "scenes"; and then the Louisville and Lexington "scenes"... all as sort of separate entities). That seemed fairly successful, so then, very shortly after, Indiana wanted to jump in (and at least here in Cincinnati, the tri-state area concept of those three states is very strong anyway); and while the Indiana "scene" isn't completely absorbed as of yet, parts of Michigan seem to want a piece of that pie as well. Lately, though, there's been a big push for West Virginia to join that community as well. I gotta say, I love that idea. While previously it felt as though the Ohio "scene" was growing into a larger Midwest community, it may just turn out to be something entirely its own. 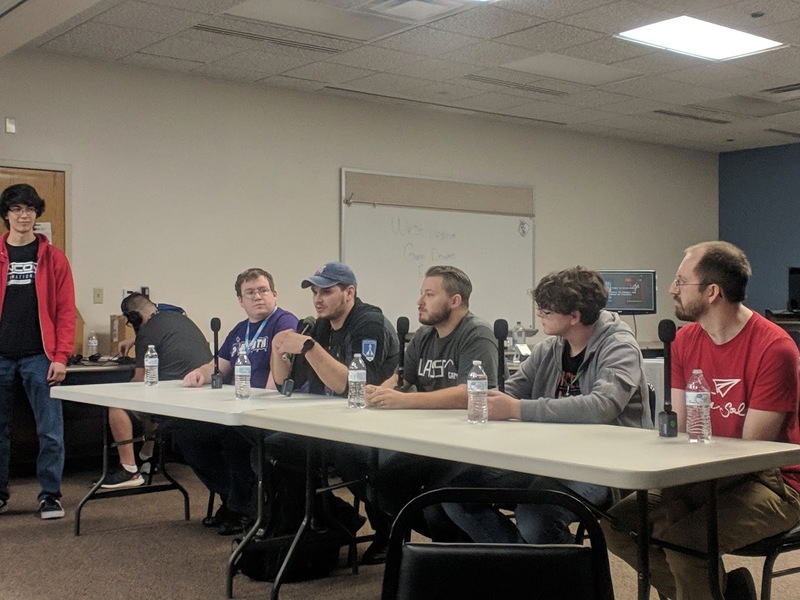 As for us, and WVGDE, last year I was asked to come down and give a talk about business in game development, a talk that I've given at several other events. Being a non-driver, though, I was scheduled to hit a Greyhound, but unfortunately, as we were pulling up to the station for me to leave, the bus rolled out. I missed my trip. Not wanting to keep them in the lurch, I'd asked if there was any way I could give my talk over Skype, and fortunately, they had the infrastructure to accommodate. What started as an hour-long talk snowballed into three hours! In those moments, I heard some of the best questions I'd ever been asked in a conference. Luckily, despite missing the event and taking up WAY more than my allotted time, they invited us back. This time, Steve drove, so we didn't have to worry about bus issues. So thankfully, transportation worked out just fine. As for me giving my talk again, that's where things changed a bit. For a little context, WVGDE is very similar to Vector Conference. It's held at a college, it has a small showcase, it's free for students, and the major draw is to hear talks from people already in the industry. It's a way for young up-and-coming developers to learn in an environment that there's not that much information about. Like some sort of madman, after my three-hour WVGDE talk, I decided that for Vector, I would submit a small handful of talks, which were just the constituent parts of my bigger talk. So instead of a business talk, the idea is to have a funding talk, a social media talk, and a press kit talk. Now, even before I started giving my business talk, I had done a "Founding a Studio" talk. The plan was to take those bits and sprinkle them throughout the other three talks. If I were to do this again, it would be its own standalone talk as well. I also put in for an accessibility talk. That left Steve at the booth. The organizers of WVGDE were very accommodating, and even let us try out our experimental "L-shaped" booth. 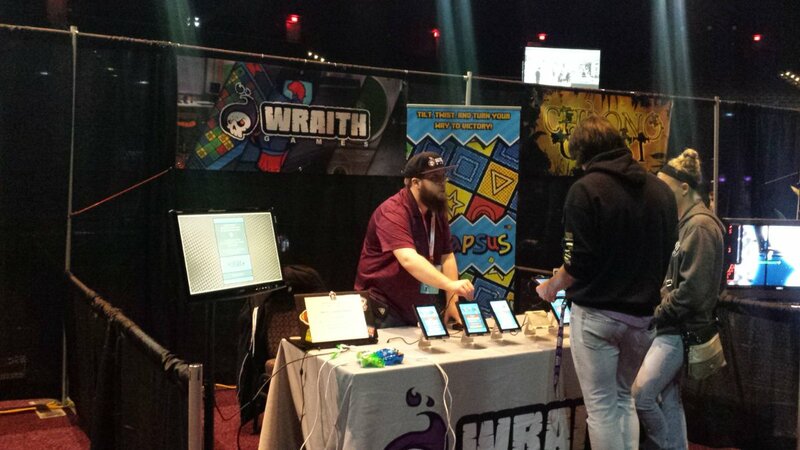 See, back at PAX East, there were so many people coming to play Collapsus, that they had to form a line. Since there was no place for people to go, that meant that they started pouring into the aisles; which as you can imagine, caused a fire hazard, which PAX staff had to come clear out. 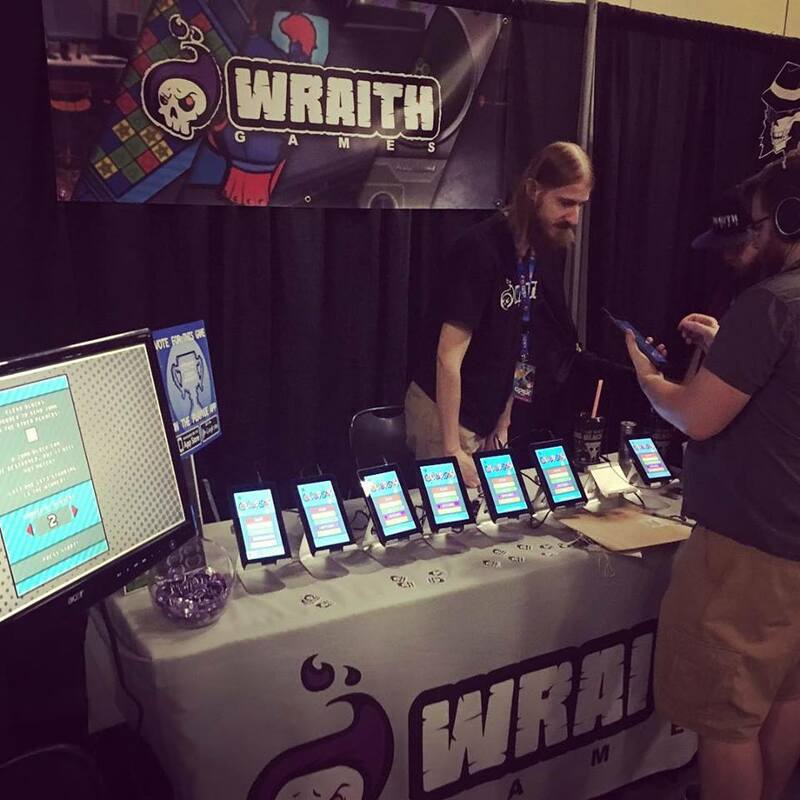 It was amazing to see so many people interested in our game; but that told us we needed a new booth setup, and after testing it out at WVGDE, we gotta say the new configuration really worked out. By all of Steve's accounts, the booth was packed most of the event; and the new setup made it easier for him to handle all those people all at once. 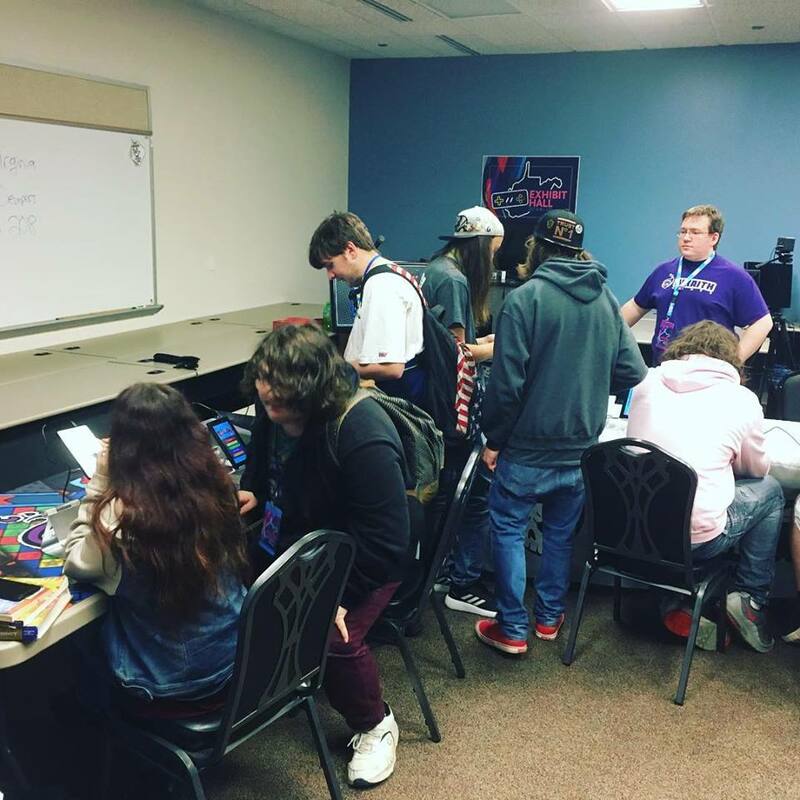 We even had multiplayer set up, but of course didn't do a tournament this time. In Steve's own words, this event made him "feel like a rockstar", and I'm inclined to agree. The welcome we got at WVGDE was so warm, and everyone was so nice, and they were so receptive to not only Collapsus but to my talks as well, that we can't wait to come back and do it again... and yes, I would happily give this many talks next time if they'll let me! I even got to FINALLY drop off the Arcade buttons I promised Amanda (The 1000 Button Project, Super Soul Games, & RunJumpDev) about a year ago! So, needless to say this set of events was absolutely packed! We do about 15 events a year, and we hope to keep doing that next year. Unless something comes out of the bushes, WVGDE was our last event for this year, and our next event will likely be Ohayocon in January. Hopefully that will also mark Collapsus' release, though we have no guarantees on that. Going to these events, making friends, seeing fans, getting feedback on the game, winning awards, and giving talks has proved to be my favorite part of the job; and one of the most important things we can do to help build our community. If you're an indie dev reading this, I highly encourage you to go to as many events as you are able. Heck, a friend of mine at WVGDE asked if I would ever consider doing a talk about events, and I honestly think I will. It's so vital to the entire process, at least from my perspective. So, unlike many of these blogs, the next couple will not be about events, but I can't wait until our next show! Catch you all next month! Reporting for Duty - The Late 2018 Progress Report! A Match Made in Matsuricon!